In the myriad of confusing and convoluted tennis history since the birth of modern tennis in 1870s, marred by elitism and amateurism, a few giants of tennis stand as the illuminating way for us to understand the vagaries of tennis. This is not a list of the ever popular, precise and totally irrelevant GOAT discussion - but rather a guide to understand tennis history and its perplexing but enthralling tennis and its characters. Populism comes and goes in each era - but there are a few on who's shoulders that the modern Federers and Sampras' stand on. Green shaded boxes represent Pre-open Era amateur division of traditional grandslams. Blue boxes represent Pre-open Era under Pro division, whose 3 Grand slam equivalents were French Pro, Wembley and US Pro till 1967. White boxes represent the Open Era, however "contract" professionals were banned for several grand slams (shown in light blue boxes) due to conflicts between NTL, WCT and ITLF till 'true' Open Era started in 1973 US Open with the formation of ATP in 1972. Note: Age at the begining of the tennis season, Jan 1. Note2: x indicates that the tournament was not held for that year. Note3: Budge served in United States Air Force during 1943-45. Laver served at Australian Army in 1957. Both are indicated by 'a' for the respective grand slams. Note4: Bill Tilden played till his untimely passing in 1953. He played in 6 more U.S Pro - 1940 (SF), 1941 (QF), 1943 (QF), 1945 (SF), 1946 (r16) and 1952 (QF). U.S. Pro was not held in 1944. Those are not shown in the table above and is indicated by 'b' on his US Open Career column. Note5: Ken Rosewall played at age 16, in 1951 Australian Championships with his first round (r32) and is not shown in the table above. It is indicated by 'c' on his Australian Open Career column. Note6: French Championships pre-1925 are from World Hard Court Championships (1912-23), which has a direct lineage to the modern French Open rather than club-member only event (1891-1924) that has been typically considered as the precursor. 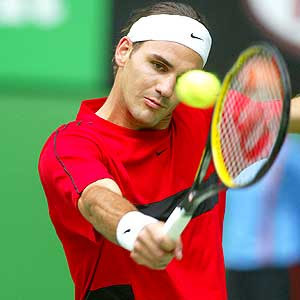 All about the swiss tennis super-star Roger Federer, an amazing person who shines beyond tennis. Get the latest word about the magic he does with his strings. Sign-up to receive new posts.